Human Dermal Microvascular Endothelial Cells (CADMEC / HMVEC) from Cell Applications, Inc. provide an excellent model system to study many aspects of endothelial function and disease, especially those related to the microvasculature and capillary systems. These cells were trademarked by Cell Applications, Inc. over 20 years ago, when they were first offered, and CADMEC™ stands for “Cell Applications’ Dermal Microvascular Endothelial Cells”. HMVEC/CADMEC have been shown to express vWF, CD36 and CD31, are able to uptake DiI-Ac-LDL and are positive for functional activity by cytokine-stimulated leukocyte adherence. Select HMVEC lots have been additionally tested to demonstrate stimulation-dependent angiogenesis and key endothelial cell signaling pathways (phosphorylation of VEGFR, Akt, MAPK, and expression of Tie2, eNOS, Axl and Etk/Bmx). See Pre-Screened Endothelial Cell Product Pagefor more information. (Cllick to Enlarge) Cell Applications Dermal Microvascular Endothelial Cells / Human Microvascular Endothelial Cells (CADMEC / HMVEC) Mono-layer (L), vessel-like structures formed in an angiogenesis assay (M), and immunolabeled for CD31/PECAM (green). Nuclei are visualized with PI (red) (R). Betapudi, V., M. Shukla, R. Alluri, S. Merkulov and K. McCrae. 2016. Novel role for p56/Lck in regulation of endothelial cell survival and angiogenesis. FASEB J, 30:3515-3526. McKerracher, L. and L. Bond. 2016. Treatment of cerebral cavernous malformations and cerebral aneurysms with rho kinase inhibitors. Patent Applications US 20160213664 A1. Termini, C., M. Cotter, K. Marjon, T. Buranda, K. Lidke and J. Gillette. 2014. The membrane scaffold CD82 regulates cell adhesion by altering α4 integrin stability and molecular density. Mol Biol Cell, 25:1560-1573. Abe, H., and S. Tajima. 2012. UVB irradiation down‐regulates type XVI collagen expression in mouse and human skin. Journal of Cosmetic Dermatology. 11:169-178. Sato, Y., X. Ren, K. Harada, M. Sasaki, H. Morikawa, S. Shiomi, M. Honda, S. Kaneko, and Y. Nakanuma. 2012. Induction of elastin expression in vascular endothelial cells relates to hepatoportal sclerosis in idiopathic portal hypertension: possible link to serum anti‐endothelial cell antibodies. Clinical & Experimental Immunology. 167:532-542. Wang, J., H. Liu, B. Chen, Q. Li, X. Huang, L. Wang, X. Guo, and Q. Huang. 2012. RhoA/ROCK-dependent moesin phosphorylation regulates AGE-induced endothelial cellular response. Cardiovascular Diabetology. 11:7. Cuttitta, F., A. Martinez, and W. Stetler-Stevenson. 2011. Methods for inhibiting angiogenesis with inhibitors of proadrenomedullin N-terminal 20 peptide (PAMP). Patent US 7862815 B2. Harris, L.J., P. Zhang, H. Abdollahi, N.A. Tarola, C. DiMatteo, S.E. McIlhenny, T.N. Tulenko, and P.J. DiMuzio. 2010. Availability of Adipose-Derived Stem Cells in Patients Undergoing Vascular Surgical Procedures. J. Surgical Research. 163:e105-e112. Liu, J., and S. Agarwal. 2010. Mechanical signals activate vascular endothelial growth factor receptor-2 to upregulate endothelial cell proliferation during inflammation. The Journal of Immunology. 185:1215-1221. Guo, X., L. Wang, B. Chen, Q. Li, J. Wang, M. Zhao, W. Wu, P. Zhu, X. Huang, and Q. Huang. 2009. ERM protein moesin is phosphorylated by advanced glycation end products and modulates endothelial permeability. American Journal of Physiology-Heart and Circulatory Physiology. 297:H238-H246. Gupta, A., C. Lobocki, S. Singh, M. Robertson, O.A. Akadiri, G. Malhotra, and I.T. Jackson. 2009. Actions and Comparative Efficacy of Phosphatidylcholine Formulation and Isolated Sodium Deoxycholate for Different Cell Types. Aesth Plast Surg. 33:346-352. Kitao, A., Y. Sato, S. Sawada-Kitamura, K. Harada, M. Sasaki, H. Morikawa, S. Shiomi, M. Honda, O. Matsui, and Y. Nakanuma. 2009. Endothelial to mesenchymal transition via transforming growth factor-β1/Smad activation is associated with portal venous stenosis in idiopathic portal hypertension. The American journal of pathology. 175:616-626. Wu, J.C., A. Chruscinski, V.A. De Jesus Perez, H. Singh, M. Pitsiouni, M. Rabinovitch, P.J. Utz, and J.P. Cooke. 2009. Cholinergic modulation of angiogenesis: role of the 7 nicotinic acetylcholine receptor. Journal of cellular biochemistry. 108:433-446. Cuttittta, F., A. Martinez, and W. Stetler-Stevenson. 2008. Compositions and methods for promoting angiogenesis. Patent US 7462593 B2. Hu, J., C. Rosen, and L. Cao. 2008. Vascular endothelial growth factor 2. Patent US 7439333 B2. Meyer, R.D., D.B. Sacks, and N. Rahimi. 2008. IQGAP1-dependent signaling pathway regulates endothelial cell proliferation and angiogenesis. PloS one. 3:e3848. Coman, T. Comprises nucleotide sequences associated with expression vector coding endothelial growth factor for use in diagnosis and treatment of tumor angiogenesis, inflammation, diabetic retinopathy, arthritis and psoriasis; wound healing agent. Patent US 7273751 B2. Hu, J., C. Rosen, and L. Cao. 2007. Methods of stimulating angiogenesis in a patient by administering vascular endothelial growth factor 2. Patent US 7186688 B1. Igarashi, K., I. Sakimoto, K. Kataoka, K. Ohta, and M. Miura. 2007. Radiation-induced senescence-like phenotype in proliferating and plateau-phase vascular endothelial cells. Experimental cell research. 313:3326-3336. Fujiuchi, S., Y. Yamazaki, Y. Fujita, Y. Nishigaki, A. Taked, Y. Yamamoto, T. Fijikane, T. Shimizu, S. Osanai, T. Takahashi, and K. Kikuchi. 2006. S-Nitrosoglutathione (SNOG) Accumulates Hypoxia Inducible Factor-1α in Main Pulmonary Artery Endothelial Cells but not in Micro Pulmonary Vessel Endothelial Cells. In THE ARTERIAL CHEMORECEPTORS. Vol. 580. Y. Hayashida, C. Gonzalez, and H. Kondo, editors. Springer US. 63-71. Hu, J., C. Rosen, and L. Cao. 2006. Polypeptide for use in the treatment of inflammation, rheumatoid arritis, psoriasis, and diabetic retinopathy. Patent US 7153942 B2. Li, H., M. Adams, V. Calenda, and V. Fataccioli. 2006. Stimulating angiogenesis enhancing the repair of connective and support tissue, promoting the attachment, fixation and stabilization of tissue implants and enhancing wound healing. Patent US 7026299 B2. Hu, C. Rosen, and L. Cao. 2005. Administering anti-Flt4 antibody or an anti-VEGF-C antibody that inhibits binding between Flt4 ligand protein and Flt4 expressed in cells to treat breast cancer characterized by endothelial cells that express Flt4 tyrosine kinase. Patent Application US 20060025331 A1. Hu, J., C. Rosen, and L. Cao. 2005. Produced by recombinant techniques and polynucleotides encoding the polypeptides; used to stimulate angiogenesis for wound healing and for vascular tissue repair. Patent Application US 20050176103 A1. Ji, H., P.A. Abshire, M. Urdaneta, and E. Smela. 2005. CMOS contact imager for monitoring cultured cells. In Circuits and Systems, 2005. ISCAS 2005. IEEE International Symposium on. IEEE. 3491-3494. Kim, W.J., J.W. Yockman, M. Lee, J.H. Jeong, Y.-H. Kim, and S.W. Kim. 2005. Soluble Flt-1 gene delivery using PEI-g-PEG-RGD conjugate for anti-angiogenesis. Journal of controlled release. 106:224-234. Li, H., M. Adams, V. Calenda, and V. Fataccioli. 2005. Connective tissue growth factor-2. Patent Application US 20060052328 A1. Martinez, A., E. Zudaire, M. Julian, T.W. Moody, and F. Cuttitta. 2005. Gastrin-releasing peptide (GRP) induces angiogenesis and the specific GRP blocker 77427 inhibits tumor growth in vitro and in vivo. Oncogene. 24:4106-4113. Hu, J., L. Cao, and A. Rosen. 20045. Nucleotide sequences coding polypeptide for use in the diagnosis, prevention and treatment of cancer, inflammation, diabetic retinopathy, rheumatoid arthritis and psoriasis. Patent US 6734285 B2. Kenny, T.P., C.L. Keen, P. Jones, H.-J. Kung, H.H. Schmitz, and M.E. Gershwin. 2004. Cocoa procyanidins inhibit proliferation and angiogenic signals in human dermal microvascular endothelial cells following stimulation by low-level H2O2. Experimental biology and medicine. 229:765-771. Duan, D., and S. Rosen. 2003. Bone marrow specific protein. Patent Application US 20030191062 A1. Ellerby, H.M., S. Lee, L.M. Ellerby, S. Chen, T. Kiyota, G. del Rio, G. Sugihara, Y. Sun, D.E. Bredesen, W. Arap, and R. Pasqualini. 2003. An Artificially Designed Pore-forming Protein with Anti-tumor Effects. Journal of Biological Chemistry. 278:35311-35316. Hu, J., L. Cao, and C. Rosen. 2003. Comprises nucleotide sequences coding mitogens for treating psoriasis, vision defects, tumors and arthritis. Patent Application US 20040143103 A1. Li, H., M. Adams, V. Calenda, and V. Fataccioli. 2001. Connective tissue growth factor-2. Patent Application US 20030012768 A1. Coleman, T. 2001. Vascular endothelial growth factor-2. Patent Application US 20030215921 A1. Hutley, L.J., A.C. Herington, W. Shurety, C. Cheung, D.A. Vesey, D.P. Cameron, and J.B. Prins. 2001. 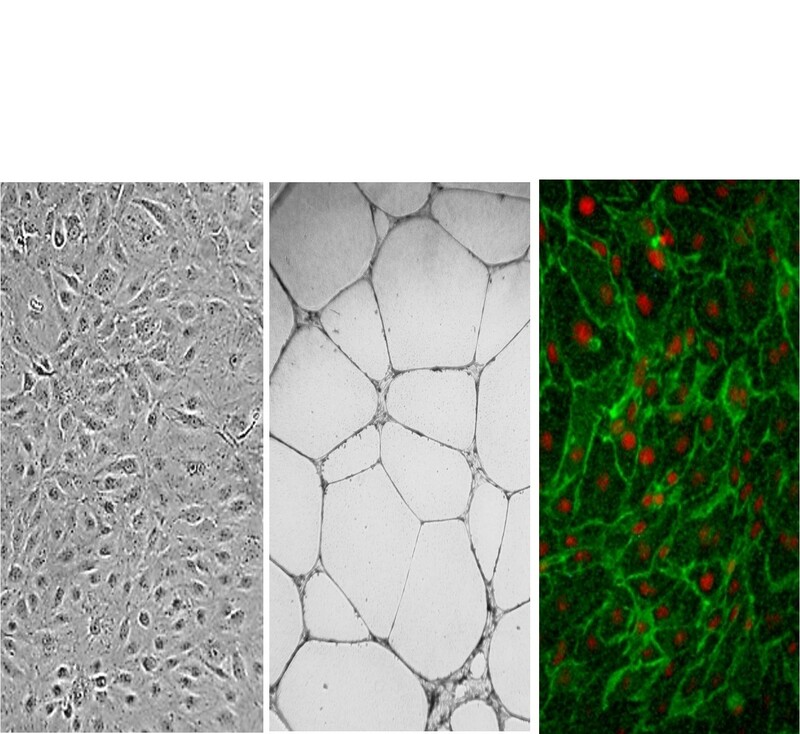 Human adipose tissue endothelial cells promote preadipocyte proliferation. American Journal of Physiology-Endocrinology And Metabolism. 281:E1037-E1044. Patel, N.A., J.A. Patel, M.F. Stins, K.S. Kim, and S.L. Chang. 2001. Dexamethasone Affects Cytokine-Mediated Adhesion of HL-60 Human Promyelocytic Leukemia Cells to Cultured Dermal Microvascular Endothelial Cells. Clinical Immunology. 99:387-394. Ruoslahti, E., R. Pasqualini, W. Arap, B. Dale, and E. Michael. 2001. Chimeric prostate-homing peptide comprising a sequence of serine-methionine-serine-isoleucine-alanine-arganine-leucine, or functionally equivalent sequence. Patent Application US 20010046498 A1. Hu, J., C. Rosen, and L. Cao. 2000. Amino acid sequence; for angiogenesis inhibitors, antitumor agents, antiinflammatory agents, antiarthritic agents for rheumatoid arthritis, wound healing agents; treatment of diabetic retinopathy and psoriasis. Patent US 6040157 A.
Chang, C., Y. Lee, J. Yang, C. Weng, and F. Wei. 1997. Pilot in Vitro Toxicity Study of 5-ALA and Photofrin® in Microvascular Endothelial Cell Cultures. J Clinical Laser Med & Surg, 15:83-87. DERYUGINA, E.I., A. STRONGIN, C. YU, and M.A. BOURDON. 1996. A novel monoclonal antibody, L1A3, is directed to the functional site of the αv integrin subunit. Hybridoma. 15:279-288. Hanasaki, K., A. Varki, and L.D. Powell. 1995. CD22-mediated Cell Adhesion to Cytokine-activated Human Endothelial Cells POSITIVE AND NEGATIVE REGULATION BY α2-6-SIALYLATION OF CELLULAR GLYCOPROTEINS. J. Biol. Chem. 270:7533-7542.